Walking through level one of the Carpenter Center for the Visual Arts, visitors these days are immersed in a visceral, dynamic experience. 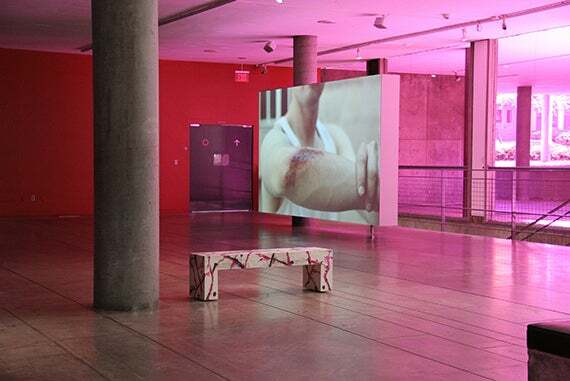 Created by Shahryar Nashat, an exhibit titled “Skins and Stand-Ins” uses video, sound, color, and sculpture to “intervene” in the space originally built by modernist architect Le Corbusier. Two benches by the artist — “Beach” and “Muscle,” created in 2015 — function both as sites of repose and sources of focus. Playing on a loop, a video features several performers, their faces just out of frame. In one clip, a man faces another with his back to the camera, arm extended. Only when he eventually turns can a visitor see an abrasion on his arm, blood welling at the crook of his elbow. The space in level one presented challenges for Nashat. The windows let in immense amounts of light, and the open floor plan means there are no walls on which to display artwork. Most challenging of all, it’s not a traditional gallery but a transitional space with high foot traffic. Nashat worked with it. Nashat’s irreverent and insightful touch is immediately evident in the museums’ space: Sculptures face the outside gardens rather than the visitor, pedestals are scuffed and stacked atop one another, and art placards are inverted. On one wall where a bronze sculpture by Käthe Kollwitz used to hang, only the hook for the art piece and a Rorschach of a gash — both natural to the space, neither created by the artist — remain. 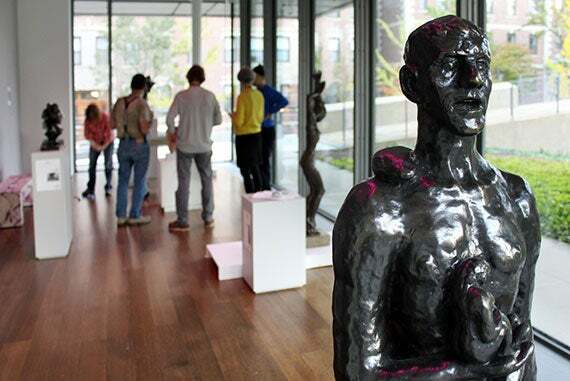 The sculpture, titled “Rest in the Peace of His Hands,” was moved for the duration of the exhibit but may be viewed in the museums’ Art Study Center on request. 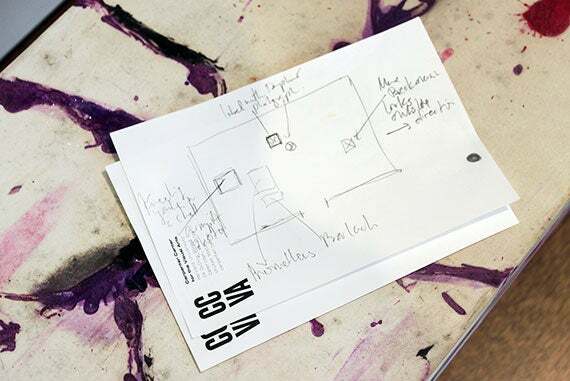 In the museums’ gallery, Nashat removed some works of art and explored the museums’ vast collections to bring other works out of storage and put them on display. In addition to sculptures by Ernst Barlach, Max Beckmann, George Minne, and Renée Sintenis already on display in the gallery, the artist added works other works by Sintenis, Georg Kolbe, Wilhelm Lehmbruck, and Gerhard Marcks. Nashat also included another of his own benches, “Repose on Display” (2015), commissioned by the center and the museums. 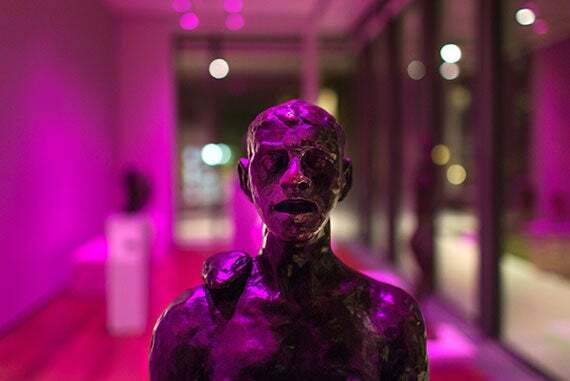 One constant through both exhibits is a vivid magenta lighting, chosen by the artist. Voorhies suggested that the exhibit offers visitors the opportunity of being lost or off-balance, something unusual in the age of technology and social media. Roth added that one benefit of inviting Nashat is the initial jolt he gives visitors. Luxuriating in both reverence and irreverence, the sacred and the profane, poet and musician Alicia Jo Rabins has published a book called "Divinity School" and also sings about Biblical women in her band Girls in Trouble.